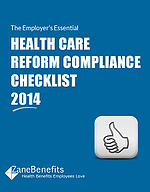 Zane Benefits, the #1 Online Health Benefits Solution, announced today the publication of a free eBook "The Employer's Essential 2014 Health Care Reform Checklist". The new eBook helps businesses understand, and take action on, new health care reform regulations in 2014. Health care reform is changing the landscape of employee health benefits, and there are new regulations that impact businesses of all shapes and sizes. And yet, many small businesses are confused about how health care reform impacts them. A recent study found that 56% of small businesses don't fully understand their obligations under health care reform. Additionally, 59% of small businesses think the cost of offering health insurance will increase in the years to come. Zane Benefits' new checklist helps Business Owners, CEOs, and HR Professionals ensure compliance with key health care reform regulations, and evaluate new cost-saving options for employee health benefits in 2014 and beyond.